Through various activities, workshops, and time to connect with other women who have the shared experience of mother loss, the Motherless Daughters Retreat will allow women to acknowledge and move through their grief with the desired goal of experiencing gratitude and joy in a new way. The $425 retreat price includes lodging at The Top of the Mill Retreat Center (two shared rooms will accommodate up to 6 women in each room, 12 maximum total participants), 5 healthy meals (Friday dinner through Sunday breakfast) catered by Amy Nadeau, snacks, drinks, and activities/workshops listed below. During breaks and free-time, participants are encouraged to express thoughts, feelings, and experiences through writing – journals will be provided. Two optional activities are available on Saturday night: henna body art (by BlurBerryBuzz) or a memory box craft (participants will decorate a box to store mementos - materials will be provided, though personal items/materials are also welcome). Release for Peace: Connecting, Creating, and Increasing Insight: During this two-hour workshop, we will discuss ways to process and release the pain of grief on a daily basis. We will identify the ways that grief can impact relationships and show up in ways we don't expect. We will explore ideas to create ritual as a tool for healing. Please come ready to explore emotional experiences, consider, and connect. Gabriel Ross will guide us through acknowledging the loss of our mothers with the written word and visual art. We will create pieces of art (that can be framed, if desired) to honor our mothers' continual presence in our lives. There will be time to share our work with one another at the end of the workshop. My Life/My Mother's Life: During this workshop, we will explore the stories of our lives and the stories our mothers' lives, examining both the similarities and differences we share with our mothers. We will also reflect on the impact of our mothers' deaths on our lives, considering her imagined perspective, and our 'before' and 'after.' Writing prompts will be provided, as well as an opportunity to share and discuss our work throughout the session. Autumn Lee will guide us through a gentle and healing meditation that will allow us to be present to and let go of the myriad of emotions we feel as motherless daughters. Betsy Elworthy Sundell All it took was the invitation from a good friend, a quick bike ride, and one crazy, intense Ashtanga yoga class at the Piedmont Yoga Studio to hook this lifetime lover of movement into a new method to explore the complexities of body, mind and spirit. Betsy has been practicing yoga ever since that memorable first class. Growing up in a home saturated with music, art, dance and two active older brothers, Betsy was attracted to the creative asana sequences, physicality and flow of a Vinyasa yoga class. Life has changed over the years, along with her practice. As a classroom teacher in the public schools, yoga provided the opportunity to recharge, realign and restore. As an expecting mother, Betsy learned to surrender to the wisdom of the body during prenatal yoga. And, as a new parent, Betsy relished the quiet connection of mother and baby postnatal yoga with Yoga Bonding. Now with two children, Betsy's practice has expanded to include these dynamic yogis. Betsy’s yoga classes for kids reflect her family’s yoga practice that integrates yoga with stories, songs, games and a whole lot of imagination. Betsy continued to study, practice yoga and completed her yoga teacher training through the Yoga Center of Minneapolis 230 hour Yoga Study Program. With her new favorite role as a mother to Reyna and Boden, a fortunate next step was to apprentice Lisa Bergly, founder and and creator of Yogabonding. Soon Betsy was a certified Postnatal Yoga teacher. The love for nurturing the mother and child bond grew into another passion, prenatal yoga. 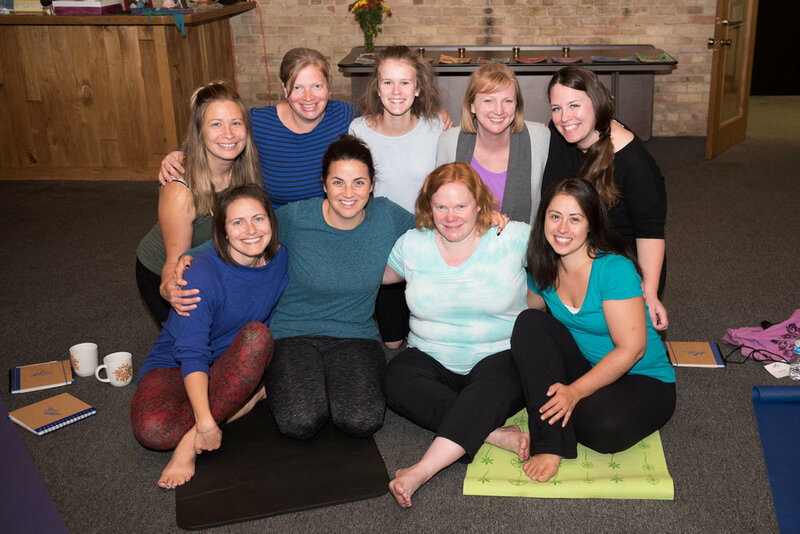 Betsy studied with both Sarah Longacre and Stacy Seebart through Blooma's Prenatal yoga trainings. Her total delight was to attend another postnatal training with Katie Wise in Bolder, Colorado and then an opportunity to develop Blooma's BYOB (Bring Your Own Baby) teacher training based on the wisdom of her teachers and of her own experience. Other credentials include a Masters degree in Education, Bachelor of Arts in Dance and English and a Certification in Participatory Arts and Research. Sarah Johnston is a Clinical Social Worker who has been working in the field of helping people since 2001. Prior to attending graduate school, she worked extensively with youth and families, especially those experiencing poverty and homelessness. After graduate school, she worked for 5 years at an outpatient mental health clinic in south Minneapolis. There she worked with people of all ages and backgrounds with a variety of mental health needs. She also completed extra training in perinatal mental health issues, experiential play therapy, and adult attachment. Gabriel Ross, (MA Catechetics and Liturgy, University of St. Thomas). Gabriel is the founding director of Creative Spirit, a non-profit organization dedicated to exploring spirituality through the arts. Gabriel has facilitated adult education courses and intergenerational programming for over 25 years. She leads women’s spirituality groups and teaches courses on comparative religions, eco-spirituality, creativity and spirituality. Gabriel designed and leads the Soul Journal programs for incarcerated women and Befriending Creation camp for girls. Her unique program offerings include drum and ritual groups and Mystics at the River. Courtney Carter is an attorney and mother of two. Courtney lost her mother in 2011, after a long battle with alcoholism. Courtney joined the Motherless Mothers Workshop at Blooma in 2014, and found it to be very healing. She first co-facilitated the workshop with Christine Friberg in April 2017. Courtney lives with her husband and two young daughters in Minneapolis. Autumn Lee believes above all in the power of love and in the comfort and strength of sisterhood. She uses yoga and meditation as a practice to calm, heal, and connect. It is through our breath and a healthy relationship with ourselves and with others that we transcend that which we do not need and become more fully ourselves. She brings a servant’s heart to her classes, and a sincere desire to create a space for personal growth and possibility. Autumn received her training at Minneapolis Yoga Center and has practiced yoga in support group settings for adult women and with high school students for the past three years. Her teaching style is warm and welcoming, and full of burning sage.